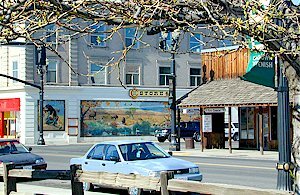 Toppenish, (TOP-pen~ish; population 9,000) Washington, located just 18 miles south of Yakima, has a comfortable Western flavor and an unusual mix of cultures that is approximately 6.5 percent Hispanic and 20 percent Native American. The prosperous center of town is made even more attractive by an outdoor mural program that has resulted in more than 60 wall murals of superior quality. The town name comes from the Native American word "Thappahn-ish" (People of the trail that comes from the foot of the hills). Its name was committed to maps, more or less, by Capt. George McClellan when he wandered through in 1853. He spelled it "Sahpenis", which was written on maps as Toppenish. The town and road map of the South Central Washington will help you locate cities, towns and other attractions.